Oreo Valiquette, the 15-month-old dog that went missing Saturday afternoon from a Four Winds Lane home, was found at about 9:30, according to his owner. A neighbor who had received one of the ‘Missing Dog’ flyers from Gabrielle Valiquette phoned at around 9:30 p.m. Tuesday saying “we hear a little dog, we don’t see anything but we can hear something,” she said. “My husband went over with a flashlight and he was there, on the property, clean and unharmed and warm,” Valiquette told NewCanaanite.com. 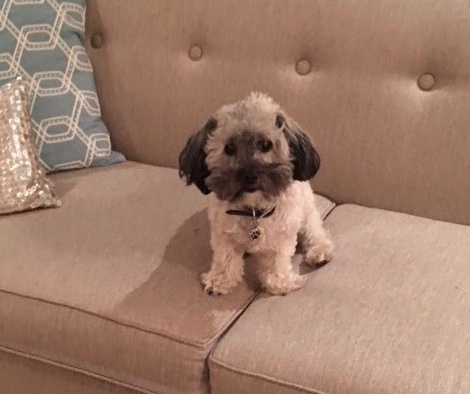 Oreo, a 10-pound Havenese and Poodle combination, has been missing since he chased after a deer in the Valiquette’s backyard on Saturday. He ultimately was found about five houses away, though it isn’t clear where Oreo has been all this time. She thanked all of those in town who have offered assistance and support during this very difficult itme. “It takes a whole village like New Canaan to make this happen,” she said. A local family is asking for help in finding their beloved 15-month-old dog who has been missing since Saturday afternoon. 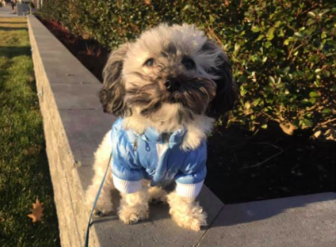 Oreo Valiquette, a Havanese-Poodle or “Havapoo,” chased after a deer around 2 p.m. on Dec. 8 from his backyard, toward the area below Greenley Road between Ponus Ridge and Chichester Road, according to his owner, Gabrielle Valiquette. Calling the past few days “a bad dream,” Valiquette said that Oreo has been like a sibling for her two young daughters. “There is just a part of our family that is missing now,” she said. Oreo was wearing a black leather collar and small paw print name tag at the time he went missing, she said. Animal Control sections of both the New Canaan and Stamford Police Departments have been notified that he’s missing, according to Valiquette. Oreo is micro-chipped and the microchip company also has him listed as missing, meaning that any shelter, veterinary hospital or government agency that scans for the chip will get Valiquette’s contact information. The neighborhood also have been posted with 100 flyers about Oreo that Valiquette has also put into mailboxes. Though at all of 10 pounds, Oreo has a “Napoleon complex” shared by many smaller dogs, Valiquette said, the barking he normally does around large dogs may have changed since he’s in survival mode. The family’s biggest fear is that Oreo has suffered due to low temperatures and wildlife such as coyotes, though it’s also possible he’s been picked up, Valiquette said. “The town is absolutely amazing, I’ve gotten phone calls from people I’ve never met, one woman showed up with flashlight to help search and people have been sharing my posts [on social media] and sending well wishes and prayers,” she said. Oreo has been a member of the New Canaan family virtually since birth, according to Valiquette. “We have had him since he was a baby,” she said. Anyone who has information on Oreo’s whereabouts is asked to please call Gabrielle Valiquette at 203-918-5255. I posted this on nextdoor.com for neighbors in Northwest Darien which includes South West New Canaan and North Stamford (11816 families). Would encourage other nextdoor areas to post as well. So happy for your family ! Wrlcome home to your baby. A Christmas Miracle !!!!! Thank You God !! !